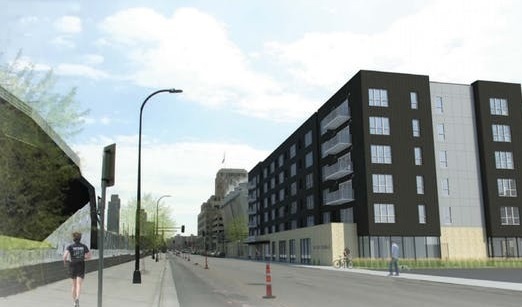 A stalled 169-unit, affordable-housing project near U.S. Bank Stadium in Minneapolis could possibly face further delays due to a lawsuit by the development’s former partner, Ryan Cos.
Ryan Cos. filed a lawsuit this week in Hennepin County District Court against nonprofit developer Community Housing Development Corp. (CHDC) and First Covenant Church Minneapolis saying it was owed $2.3 million before it was fired in August for its work on the East Town Apartments. The $37 million workforce housing project is planned to be built on a parking lot next to the church on 9th Avenue S. across 6th Street from the stadium. “After three years of working diligently on this much needed affordable housing project, we are incredibly disheartened to find ourselves in this situation,” said Mike Ryan, market leader of Ryan Cos., in a statement. CHDC President Elizabeth Flannery said on Wednesday she was advised to not comment extensively on the case, but CHDC’s position would be detailed in documents filed Friday. “We disagree with them and we will respond,” Flannery said. In February 2015, Ryan Cos. and CHDC entered into a contract for the project in which Ryan Cos. agreed to provide design management and other preconstruction services, according to court documents. At the end of August, CHDC informed Ryan Cos. that it was terminating its agreement “for no other reason than to allegedly save money,” according to court documents submitted by Ryan Cos.’ attorneys. In a termination letter to Ryan Cos. filed in court documents, Flannery wrote that “the budget for the project is incredibly tight” and “given what we understand Ryan’s total project costs might be,” CHDC couldn’t move forward with Ryan Cos. Frana Cos. has reportedly replaced Ryan Cos.
Flannery offered to pay Ryan Cos. more than $531,000 and a subcontractor $652,000, but Ryan Cos. later responded that the amount wasn’t enough to cover what Ryan Cos. paid to other subcontractors and consultants. Ryan Cos. said it was “instrumental” in the project by introducing CHDC to the church, developing a strategy for converting the parking lot, and negotiating various aspects such as a land swap that was needed to build on the lot. It said it also obtained land-use permits, assisted with finding financing and met with church leadership, city officials and other stakeholders to facilitate the project’s completion. Ryan Cos. led the recent development of the part of East Town near U.S. Bank Stadium that includes the Commons park, Wells Fargo towers and Radisson Red hotel. At one point the East Town Apartments project was expected to be finished in time for the Super Bowl earlier this year, but it was delayed as logistics around the big game complicated timelines and project leaders finalized financing. During a Tuesday meeting, the Hennepin County Board of Commissioners acting as the county’s Housing and Redevelopment Authority authorized the issuance of tax-exempt multifamily housing revenue bonds for the project. The workforce housing development is proposed to be available for renters who earn at or below 60 percent of the area median income which for a household of four is $56,580. In a pricey downtown rental market, affordable housing can be hard to find. The apartment development was scheduled to break ground by the end of the month, but the lawsuit could possibly stop or at least further delay the project, said Dan Collison, lead pastor at First Covenant Church and executive director of the East Town Business Partnership, of which Ryan Cos. is a member. “First Covenant Church is named in the lawsuit, and I am speaking only for the church when I say that First Covenant wishes that the dispute between CHDC and Ryan Cos. could have been resolved between them and without Ryan Cos. choosing the path of litigation. … We hope that the dispute gets resolved quickly so that the project will move forward to bring great benefit to the downtown community,” Collison said.